No more downloading and uploading. No need to login to each cloud account to download and upload files. With CloudFuze move feature you can now migrate all your Dropbox files to OneDrive in just 3 simple steps. Select your files from source cloud and select destination folder and click move. CloudFuze ensures that your files are transferred from cloud to cloud automatically. Using CloudFuze, you can move your files from Dropbox to Microsoft OneDrive, or OneDrive for business or Office 365. CloudFuze move tab allows an easy drag and drop of files from your Dropbox account to OneDrive or Office 365 account. You can see simple instructions below to move files from DropBox to Microsoft OneDrive. Step 1: Go to CloudFuze Move Screen . Once you click on “Move” icon on CloudFuze browser app, you will be navigated to CloudFuze “Move” screen. This screen allows you to select a source cloud and source files to be moved from Dropbox to OneDrive. In this case, you will select your files from your Dropbox account. 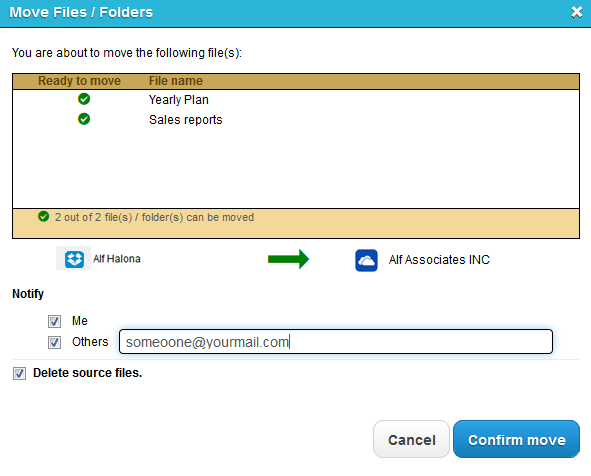 Step 2: Select your source cloud and files ( Files from your Dropbox account) . Navigate to your Dropbox account and select the list of files and folders you want to transfer to OneDrive. You can select files and folders from the left side of the screen, which represents source cloud and source cloud files. Select OneDrive as source cloud and Dropbox as the destination cloud if you would like to transfer from OneDrive to Dropbox. Step 3: Select your destination cloud and folder ( OneDrive account and destination folder in OneDrive account) . The destination clouds and the list of files and folders are represented on the right hand side of the screen. You can select your OneDrive account and the destination folder to transfer files from the selected Dropbox account. To initiate file transfer from your selected Dropbox account to OneDrive account, just click the “Move” button at the bottom right hand corner. Once you click, you will be given an option to confirm your file transfer and also select any notifications needed. After you click on “Move” button, you will see a move confirmation window as below. In this screen, you can select to Notify others, once the move is completed. By default, the owner of the account will be notified once the move is completed. You can uncheck, if you don’t want to receive any notification after moving your files. Tip: Option to copy or move files from your Dropbox account to your OneDrive account. By default CloudFuze moves files from your source cloud account to destination cloud account. If you want to copy files instead of moving, you can just uncheck the option “Delete Source files” in the above screen. After you click on “Confirm Move”, you will see a message that the move has been initiated. Next you will see the file migration status and notification once the “Move” is processed.